Hello Partners. A recent announcement was made that Skype for Business Broadcast meetings are now available for use if you have an Office 365 tenant, with E1, E3, E5 or Skype for Business Online Plan 2. Skype Meeting Broadcast enables licensed Office 365 users to produce and broadcast a Skype for Business meeting on the internet with up to 10,000 attendees and enables users to access the meeting via a browser on virtually any device. Skype Meeting Broadcast makes it easy to host large virtual meetings like internal “Town Halls” and public webinars. Perhaps you have tried to go to the Skype for Business Broadcast Meeting portal (https://broadcast.skype.com) and tried to create a meeting only to be met with disappointment and being told that you don’t have permission to create a meeting. You may be wondering, Where do I go to turn on this functionality so I can create meetings? Well Good news for you is I’m going to show you how in a few simple steps. First verify that you are running version 3.0 or higher of Windows PowerShell. You will also need to install the Windows PowerShell module for Skype for Business Online that enables you to create a remote Windows PowerShell session that connects to Skype for Business Online. This module, which is supported only on 64-bit computers, can be downloaded from the Microsoft Download Center at Windows PowerShell Module for Skype for Business Online.. Restart your computer if you are prompted. From the Start Menu > Windows PowerShell. NOTE: If you get an error here that talks about New-CsOnlineSession is not a valid Command, you will likely need to re-launch PowerShell by right clicking on it and selecting Run As Administrator. This is typically only the case if you have installed the Skype For Business Module and have not rebooted before you try to use it. 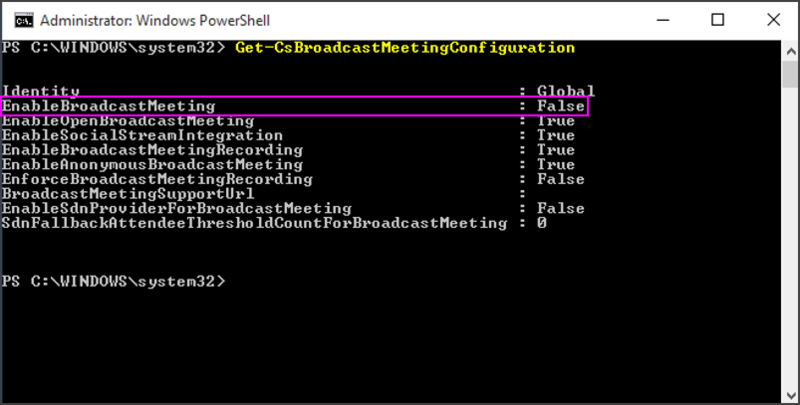 You can confirm the setting is enabled by running Get-CsBroadcastMeetingConfiguration again. Tip After you make the change, it may take up to an hour to take effect in the Skype Meeting Broadcast portal. There you go, you can now go and start leveraging Skype For Business Broadcast meetings. Let us know how your experience goes by leaving a comment below this post. 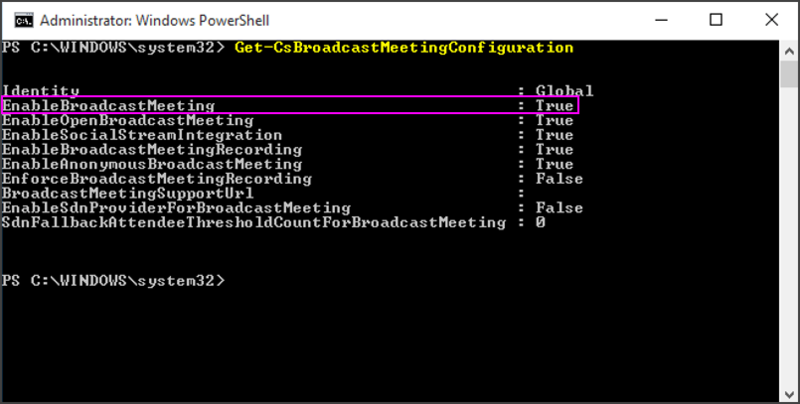 I think this poses an issue in that we have Lync 2010 on prem, but want to use ONLY meeting broadcast in the cloud. We are nearing a Skype upgrade in the next month or so, but will continue to be on-prem. How do we configure ourselves for on-prem PLUS meeting broadcast? so how do you restrict users who can create broadcast events?